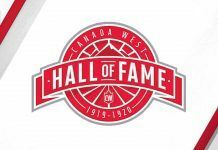 Two-sport star Temitope Ogunjimi of the Calgary Dinos and reigning university football player of the year Ed Ilnicki of the Alberta Golden Bears have been named the Canada West Athletes of the Year. The pair were announced Tuesday as the conference’s top athletes from the 2017-18 season, as U SPORTS unveiled the nominees for the 2018 BLG Awards, which honour the top university athletes in the country. Ogunjimi excelled as a wrestler and rugby player during her five seasons at the University of Calgary, winning five Canada West wrestling gold medals and a pair of rugby conference championships. 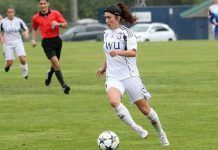 On the pitch, the Calgary native helped turn the Dinos into a conference power, winning back-to-back CW titles to end her career. As a wrestler, Ogunjimi was both a conference and national champion in 2017-18, while being named U SPORTS Outstanding Wrestler, and winning the national Student-Athlete Community Service Award. 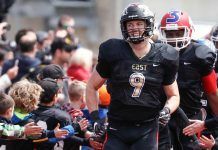 Meanwhile, Ilnicki is coming off one of the best seasons in Golden Bears and Canada West football history in 2017, winning both the conference and national player of the year awards. 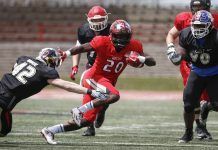 The fifth-year running back set a new single-season Canada West rushing record with 1,468 rushing yards, while also leading the country with 11 rushing touchdowns. On top of his athletic accomplishments, Ilnicki also spent the year as the President of the University Athletics Board, winning the Canada West Football Student-Athlete Community Service Award. Both CW athletes now move forward as the conference nominees for the national athlete of the year awards, and will be joined by athletes from the three other U SPORTS conferences – Atlantic University Sport (AUS), Réseau du sport étudiant du Québec (RSEQ), and Ontario University Athletics (OUA). The BLG Awards were established in 1993 by U SPORTS and national law firm Borden Ladner Gervais LLP to recognize the top male and female athletes from U SPORTS-affiliated universities. Temitope Ogunjimi finishes her career as one of the most decorated student-athletes in University of Calgary Dinos history. Now, she’ll look to make history as the first in her sports to capture the BLG Award. Neither wrestling nor rugby have ever captured the BLG Award, male or female, in the honour’s 25-year history – something the 22-year-old Calgarian and aspiring lawyer could rectify with a win June 4 in Vancouver. After immigrating to Canada from Nigeria at age 10, sport was a way in to the community for Ogunjimi. She took up wrestling in junior high school at the suggestion of a teacher and found it was a good way to make friends, and she enjoyed the sport. She added rugby in high school, having always enjoyed running. After graduating from Calgary’s Centennial High School, she enrolled at the University of Calgary in September 2013 initially intending to pursue an engineering degree before settling on a law and society major, setting her up for her long-time dream of attending law school. Athletically, she focused on wrestling and captured her first of five consecutive Canada West gold medals in 2014, earning conference Rookie of the Year honours after her win at 59 kg. She jumped up to 63 kg a year later, winning the conference title in that weight class for three consecutive years. Ogunjimi added varsity rugby to her plate in the fall of 2016, joining the Dinos program and helping them capture their first-ever Canada West title and a trip to the U SPORTS championship, where they won the bronze medal. She was named an All-Canadian along with a conference all-star after scoring five tries in the Canada West semifinal. Back on the wrestling mat, she won a third straight CW gold medal at 63 kg. Heading into her last season of varsity competition, Ogunjimi was back on the rugby pitch where she again earned All-Canadian status as the Dinos won their second straight conference title and finished fourth at the national championship. With her focus back to wrestling in 2018, she moved up to 67 kg and won a fifth straight Canada West title and headed to the U SPORTS championships in Sault Ste. 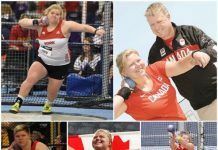 Marie, Ont., in search of that elusive national title. In the final bout of her university career, Ogunjimi climbed the mountain to take home U SPORTS gold, then added Outstanding Wrestler of the Year honours as well as the national Student-Athlete Community Service Award to her portfolio. She added another gold medal to her collection at the Wrestling Canada senior national championships in March, winning the 68 kg weight class. On Apr. 3, Ogunjimi was named the University of Calgary’s female athlete of the year. 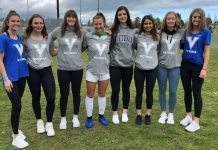 “For sports like wrestling and rugby, this kind of recognition is important – these are sports where athletes at the varsity level go on to represent Canada, and recognition like this helps them continue to grow in prominence. Personally, this makes me feel like the work I’ve put in over five years is being recognized,” said Ogunjimi. Ilnicki broke the Canada West single-season rushing record with 1,468 rushing yards in 2017, leading the Golden Bears back to the Canada West playoffs for the first time since 2010. Ilnicki also added 151 receiving yards in 2017, breaking a 42-year old program record for single-season all-purpose yards with 1,619. The Spruce Grove, Alta., product also led U SPORTS in carries and rushing touchdowns this past season, winning the prestigious Hec Crighton Trophy as the top football player in Canada. His rushing total was tops in the country by more than 300 yards and the fifth most all-time nationally. Ilnicki concluded his five-year career as Alberta’s all-time rushing leader with 4,145 yards – the second most all-time in Canada West history. He also ends his career as the Golden Bears’ all-time leader in all-purpose yards (4,978), carries (691), and rushing touchdowns (28).